From FullContact for Web, click Forgot Password or go directly here. From FullContact for iOS / Android / Mac, click Forgot Password. From FullContact for Gmail, click Sign in with Email, then click Forgot Password. Your password has to be at least 6 characters long, contain at least 1 upper case letter and at least one special character or numeral. Please know that when the password is changed/reset, it can sometimes take a few minutes for the new password to take effect. Please give it a moment and try again. The easiest way to change your login email address or password is on the Account page in the FullContact for Web app. Click in the Email or Password fields to edit the email address or password associated with your account. 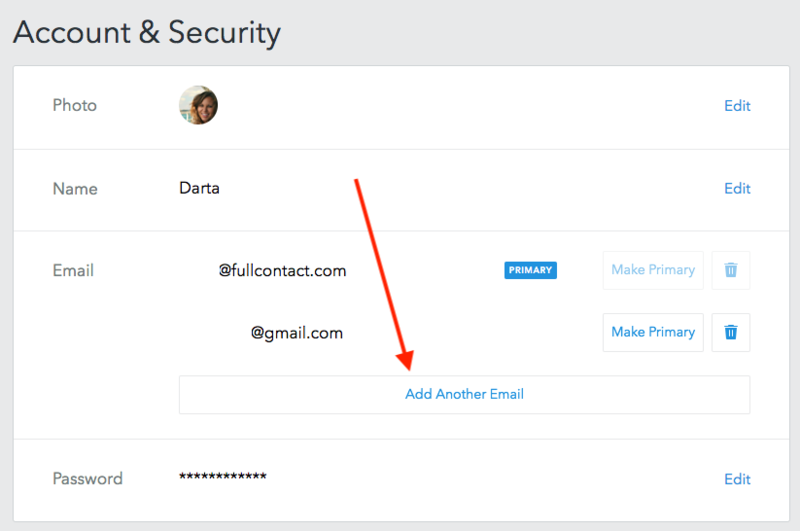 Notice that you can add multiple logins for one FullContact account (however, you cannot add an email address to your login IF it is already associated with another FullContact account). Please note that you can't change your credentials in FullContact for iOS / Android / Mac. Can multiple people log into the same FullContact Apps’ account? Yes. Multiple people can log into the same FullContact account (using the same credentials) on multiple devices at once. However, we recommend creating a FullContact for Small Business account instead. Does FullContact support two-step verification? No, however, if you have a Google account with 2FA enabled, you can use it as your login without ever creating a password with FullContact. How do I sign out of my FullContact account? In FullContact for Web, click on your profile photo in the upper-right-hand corner, then click Sign Out. In FullContact for Mac, click File -> Sign Out. In FullContact for iOS, click Settings icon in the lower corner on right-hand side -> your email address -> Sign Out. In FullContact for Android, click on your email address (top of the home page) -> Log Out. In FullContact for Gmail, click on Settings (bottom-right-hand corner of the plugin) -> Sign Out. How can I validate email addresses used for "My Profile"? To add email addresses to "My Profile", you first have to make sure they are verified and added to your Account. To do that, go to the Account page in the FullContact for Web app -> click "Email" and add all the email addresses you want to be associated with your "My Card". Note: A verification link will be emailed to you right after adding an email address and you'll only be able to update your "My Card" once the email address is verified.